These reusable baby food pouches are an extremely portable, and disposable way to store, freeze, warm and serve homemade baby food. Now these award winning baby food pouches are available in fun prints. BPA, Phthalate and PVC Free - Entirely BPA Free and microwave, bottle warmer and freezer safe, these pouches have a generous 150ml capacity making them the perfect size for single meals when on the go with the baby. 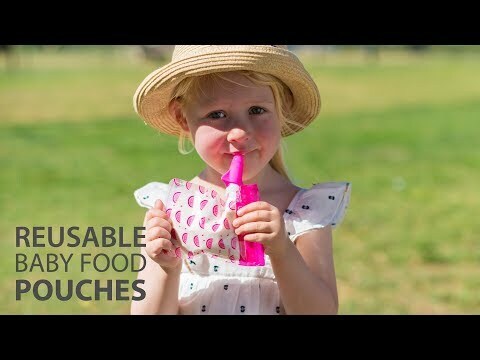 They are extremely portable, reusable and a disposable way to store, freeze, warm and serve homemade baby food. This starter pack included 10 pouches (5 of each colour) that are pre-sterilised with tamper proof ziplock seal ready for use straight out of the box. Simply pour in baby food, seal, freeze, store, warm, serve and dispose or re-use! Perfect to use with Cherub Baby Natriblend 4 in 1 Food Preparation Unit. No mess, no fuss, no washing up.